Toledo Pickleball Club (TPC) May Tournament Recaps – Charlie McKnight Reporting – Pickleball is Thriving in Northwest Ohio! 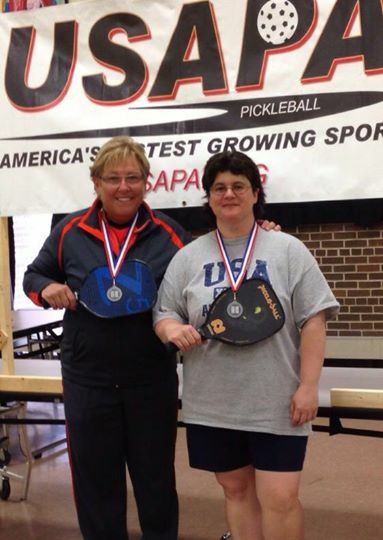 The Mix It Up In May, 2014 Pickleball Tourney was held in Howell, MI on May 17-18th. The team of Betsy Kenniston and Susan DeAngelis battled their way to the silver medal in the Women’s 3.5 Doubles, where they lost (a second time) to the winning team of Kantak-O’Toole in a very close and hotly contested three game finals match (12-10 in the third). Another Toledo Pickleball team of Carol Martin and Liz Sepeda saw double trouble in this event also, as they encountered the Kenniston-DeAngelis team twice, losing to them in the first round (3 games) and then losing to them in the consolation round (15-13) to finish fourth in that division. Another TPC team of Tim Hacker and Charlie McKnight competed in the 4.5 doubles and tasted a quick double defeat. The Pickleball Fever in the Zoo – Bob Northrop Memorial Tournament was held in the Wings West Ice Arena in Kalamazoo, MI on May 23-25th. The team of Marsha Koch and Josh Grubbs won the Gold in the 5.0 mixed doubles, with Jessica LeMire and her younger brother Alex taking home the sliver. The Lemire’s battled the team of Susie Wiartalla and Tom Wells (who finished fourth) in the consolation round, winning a close one at 15-13. Tom Wells and Paul Sprainitis won the Bronze in the 5.0 men’s doubles by beating the team of Al Hager and Sebastian Krzywicki in three games in their second round match. Marsha Koch and Jessica LeMire cruised through the Gold in the 5.0 women’s doubles in round robin format, defeating both of their opponents in two games. Susan Wiartalla and Merriann Murphy won the Gold in the 4.5 women’s doubles, defeating the number one seeded team of Doke-Knieper twice. Betsy Kenniston and Liz Sepeda took the long way home in winning the Gold in the 3.5 women’s doubles by losing their first match and then having to win seven matches in a row (including two tough matches in the gold round). The team of Susan DeAngelis and Connie Mierzejewski also participated in this division, losing their first round match and then winning two close matches in the consolation round before bowing out to the eventual 5th place team. Tim Hacker and Charlie McKnight won a tough first round match against the number one seeds, before losing the next two matches in the 4.5 men’s doubles. Way to go Team Toledo!!! !